Edmonton's most anticipated annual event, Capital Ex, is nearing! From Friday, July 23rd to Sunday, August 1st the exhibition will take place at Northlands, which will host dozens of rides & games (hopefully not the Scorpion ride from the Stampede! 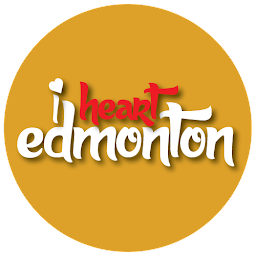 ), free concerts, food & shopping, fireworks, and 522,000 square feet of exhibits at the newly renovated Edmonton EXPO Center (including a casino, and beer & wine gardens). Amongst the impressive list of guest performers at TELUS Stage during the 10-day event are Kardinal Offishall & Karl Wolf (July 23), Colin James & Odds (July 24), George Canyon & Gord Bamford (July 25), Stereos, Down with Webster & Jhevon (July 26), Sloan & Maurice (July 27), April Wine & Shawn Hlookoff (July 28), Shane Yellowbird, Dean Brody & Hey Romeo (July 29), Metric & Hot Hot Heat (July 30), Hedley & Social Code (July 31), and Default & illScarlett (August 1). (All shows begin between 7:30 and 8:30PM). Gate prices are $12 (ages 13+) or $6 (ages 7-12) (free under 6), though Coca-Cola Ride-All-Day Passes are $38. Fireworks are nightly at 11PM. Speed junkies rejoice, for the sixth annual Edmonton Indy (Honda Indy Edmonton, to be exact) is almost here! As part of the IndyCar Series, Edmonton's Indy will take over the City Centre Airport from Friday, July 23 to Sunday, July 25. There are three different 3-day ticket packages available at Ticketmaster: Bronze package for $135, Silver package for $160, and Gold package for $240. You can also purchase single-day tix ($35-65), a Paddock Pass ($20), or a Pit Walk Thru Pass ($10), though convenience charges will apply. 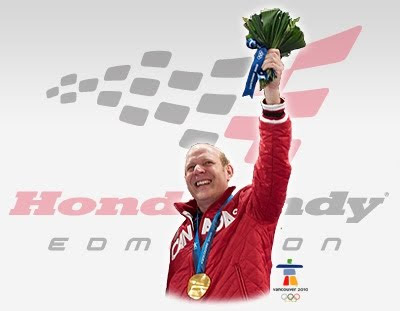 Olympic gold medalist Kevin Martin (pictured above) will be this year's Northlands Honourary Grand Marshal, leading the 2010 Capital Ex Parade on Thursday, July 22 (10AM), and appearing at the Honda Indy on Sunday (July 25) at 3PM. 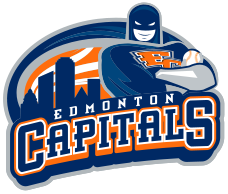 The Edmonton Oilers have been hogging all the headlines lately, and the Eskimos are preparing to host the Grey Cup on their newly renovated field, but it's the Edmonton Capitals that we should be paying our attention to, really. That's because our semi-pro baseball team recently ended a record-tying winning streak, after 13 straight wins as part of the Golden Baseball League. The Caps, which were purchased last year by Daryl Katz, beat the Yuma Scorpions 6-4 on July 15 for their 13th consecutive triumph, but lost to that same team the following day. This impressive tally came close to tying the record for any Edmonton professional sports team, owned by the Eskimos' 14-game winning streak in 1954-55. For the Capitals' complete schedule click here. Just take a look around, Edmonton. We love to eat! That must be why one of our city's most popular annual festivals is A Taste of Edmonton, which will invade Sir Winston Churchill Square from Friday, July 23 to Sunday, August 1 (11AM-11PM). In addition to wine & beer tasting, craft vendors, and live entertainment, folks are welcome to graze over samples of entrees from over 40 local eateries, including Khazana, The Creperie, The Hat, Pazzo Pazzo, L'Espresso Cafè, Blue Willow Restaurant, and Zucchero Cappuccino Bar. For a complete list of participating restaurants click here. 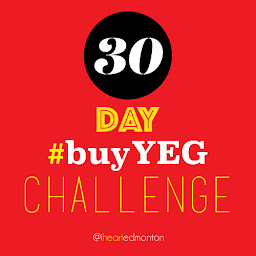 Tickets are available at Tix on the Square (780-420-1757), where you can purchase a sheet of 30 for $30 (save 10% until July 22 by purchasing advance tickets). The 10-day event, one of the largest of its kind in North America, will also coincide with Night of Artists, a visual and literary exhibit at the nearby Three Bananas Cafe. 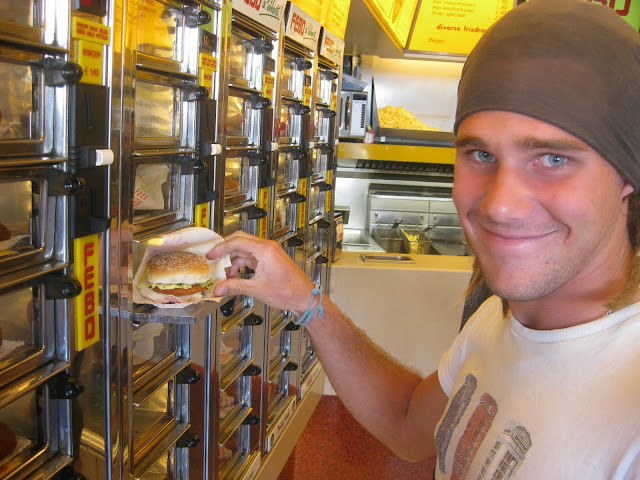 There are 15 new menu items this year. 33 firms have submitted their proposals for redeveloping the 217-hectare site where the City Centre Airport currently resides. Companies from Edmonton and across Canada, and as far away as Denmark, Sweden and India are potential candidates to design an eco-friendly community (for about 30,000), after the city embarked on an international competition back in May. "In some cases, the municipal airport is kind of a small project for them," said Rick Daviss, Edmonton's manager of corporate properties. "We were expecting a large number of submissions. We weren't expecting the quality of the submissions we got." The city will narrow those 33 down to a short list of five by August 14, and construction could start in 2012. After a two-year, $5.4 million revitalization period, the 50-year-old Fred Broadstock Outdoor Pool has finally reopened (July 17) for anyone to enjoy. The 25-metre pool, located at 15720-105 Ave., is open from 11AM to 7PM daily until the end of summer (August 31). For more information call 780-442-5261 or 311. 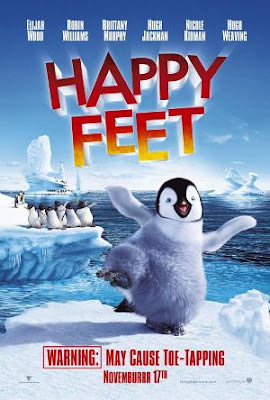 The Edmonton Valley Zoo (13315-Buena Vista Road) will be hosting a family film night on Thursday, July 22 (6-10PM), as a new LED screen will air the animated Happy Feet (2006), featuring the voices of Elijah Wood, Robin Williams, Nicole Kidman, Hugh Jackman, and the late Brittany Murphy. The Clean Air Cinema movie, which starts at 8PM sharp, will set you back $10.50 for adults, $5.25 for children, and $8 for youth & seniors, or $31.50 for the whole family. Sponsored by ATB Financial, the night will also include face painting, popcorn & cotton candy, and refreshments. Next month's feature will be Finding Nemo (2003) (Thursday, August 19). Fort Edmonton Park is now under construction, ambitiously recreating the 250-seat Capitol Theatre venue that will host both live theatre and films once it opens in spring 2011. The $11 million project will see the historic venue up and running for the first time in decades. It was originally erected by the Allen Brothers on Jasper Avenue (100A-101 St.) in 1918, presenting silent movies. It was renamed Capitol Theatre when it was purchased by Famous Players in 1923, and renovated for talking pictures six years later. "Once again Edmontonians have worked to create something wonderful in one of our most special places, Fort Edmonton Park," remarked Mayor Stephen Mandel. "The Capitol Theatre will bring a whole new energy to the park, broaden the visitor experience and enhance the vibrant live arts scene in the greater community." The 25th annual Blueberry Bluegrass & Country Music Festival is coming to Homecoming Park (4202-50 St.) in Stony Plain, just minutes west of Edmonton, from Friday, July 30 to Sunday, August 1. Western Canada's largest bluegrass fest has welcomed many big names over the years, and continues this season with Rhonda Vincent & The Rage, The Gibson Brothers, The Claire Lynch Band, The Mashville Brigade, Dailey & Vincent, The Spinney Brothers, Fred Eaglesmith, Hard Ryde, A Page in Time, Loose Rooster, Woodbend, The Bix Mix Boys, and Trey Gates & Family. The 3-day event will also include Kids Corner, food concessions & craft tables, workshops, a slowpitch jam, and a Sunday morning gospel showcase. Daily tickets are $45, or you can buy a 3-day pass (@ Ticketmaster) for $100. Bring your lawn chairs and sun screen! There are plenty of musical acts gracing our town over the next few weeks, so you'll have a wide variety to choose from: The Cat Empire @ Starlite Room (July 22 @ 8PM), Neil Young @ Jubilee Auditorium (July 23 @ 8PM), Drake @ Edmonton Event Centre (July 24 @ 8:30PM), Maestro Fresh Wes & C+C Music Factory @ the Downtown Party Tent (July 24 @ 6PM), Said the Whale @ Starlite Room (July 29 @ 5PM), Meat Loaf @ Rexall Place (July 29 @ 7:30PM), Juliette Lewis @ Starlite Room (July 30 @ 8PM), LeAnn Rimes @ River Cree Casino (July 30 @ 8PM), Reverend Horton Heat @ Starlite Room (August 3 @ 8PM), Ray Griff @ Century Casino (August 6 @ 8PM), Backstreet Boys & Shawn Desman @ Rexall Place (August 9 @ 7:30PM), Scorpions @ Shaw Conference Centre (August 10 @ 6:30PM), Airbourne & Social Code @ Edmonton Event Centre (August 10 @ 8PM), Bryan Adams @ Winspear Centre (August 13 @ 7PM), etc., etc., etc. Tickets for all these shows are available at Ticketmaster. Our favourite local podcast, The Unknown Studio, most recently invited The Edmonton Journal's video game blogger Ben Gelinas as their special guest speaker, which you can listen to here. One of our other favourite podcasts, Nathan's Podcast, discusses homosexuality, Canadian music, and dumpsters(!) 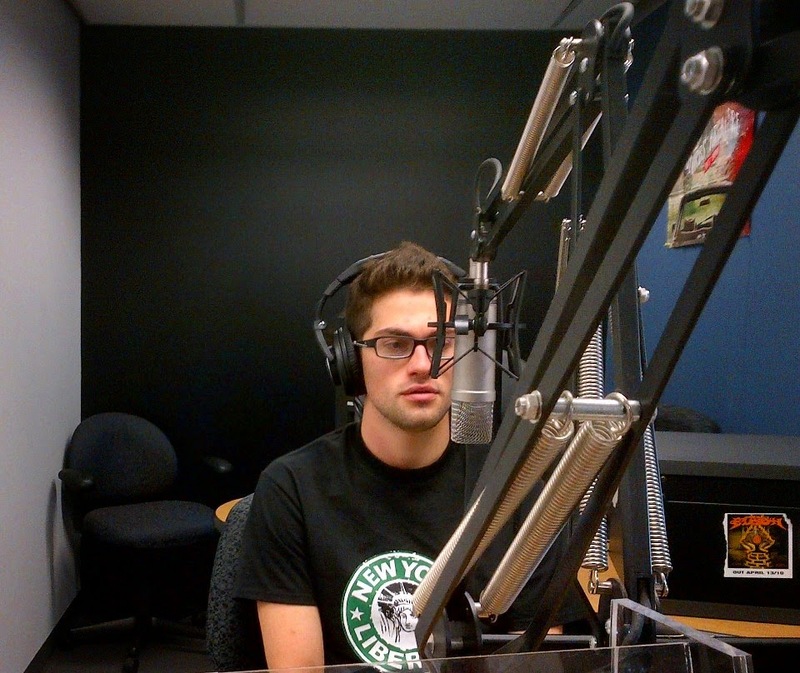 with co-host James Ross...listen here. Today (Sunday, July 18) also marks the final day for both the 26th annual Edmonton International Street Performers Festival (July 9-18) and the 15th annual Whyte Avenue Art Walk (July 16-18), so go check them out. I Heart Edmonton would also like to encourage anyone who is interested to print off this poster and display it where you can (please ask permission of businesses), to help locate missing St. Albert couple Lyle & Marie McCann. You can also join the Facebook group that is helping look for the McCann's, as well as "person of interest" Travis Edward Vader. Thank you for your support. Below is a promotion clip for Capital Ex 2010.